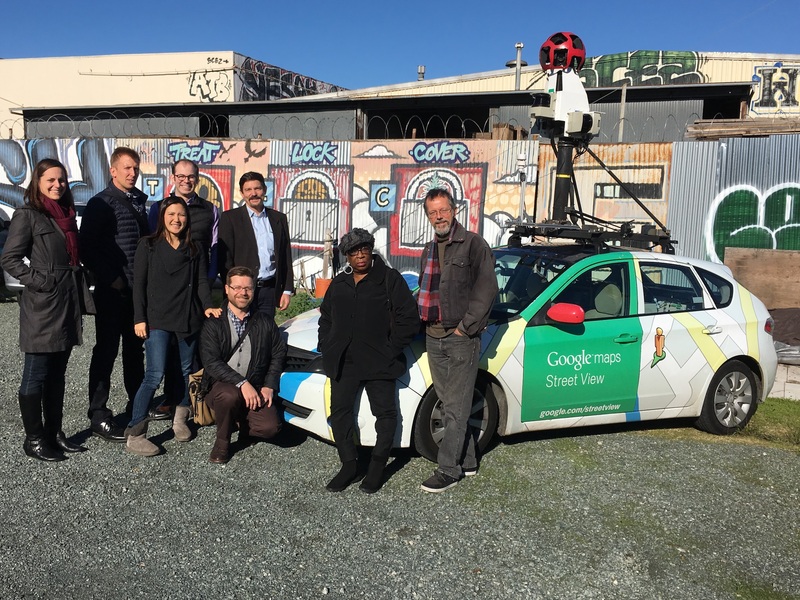 We used two specially equipped Google Street View cars to repeatedly map gaseous and particulate air pollution, block-by-block, in Oakland, California. By using a year of repeated measurements, our algorithms were able to map pollution at 30 meter scales - an unprecedented resolution for a measurement dataset. We find that air quality can persistently vary even within individual city blocks. We determined that the data requirements for making stable, high-resolution pollution maps are surprisingly modest. This straightforward measurement approach is now being scaled up to other cities around the world. The challenge: how does air quality vary within cities? Most routine air pollution measurements in cities are collected at a small number of "ambient" monitoring sites that provide information on urban-background concentrations. In the US cities, there are generally 2-3 ambient monitoring sites for every million people. Therefore, despite the fact that air pollution can vary sharply in urban areas, our understanding of how pollution varies at the block-to-block scale is quite limited. 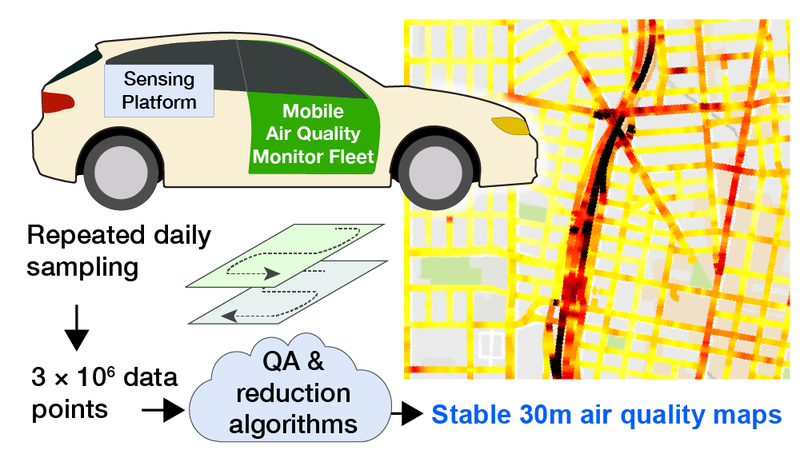 This study demonstrates a new approach to filling this data gap by using specially equipped Google Street View cars to map urban air pollution every 30 meters, at 100,000× higher spatial resolution than possible with official monitors. Article: Apte JS, Messier KP, Gani S, Brauer M, Kirchstetter TW, Lunden MM, Marshall JD, Portier CJ, Vermeulen RCH, Hamburg SP. 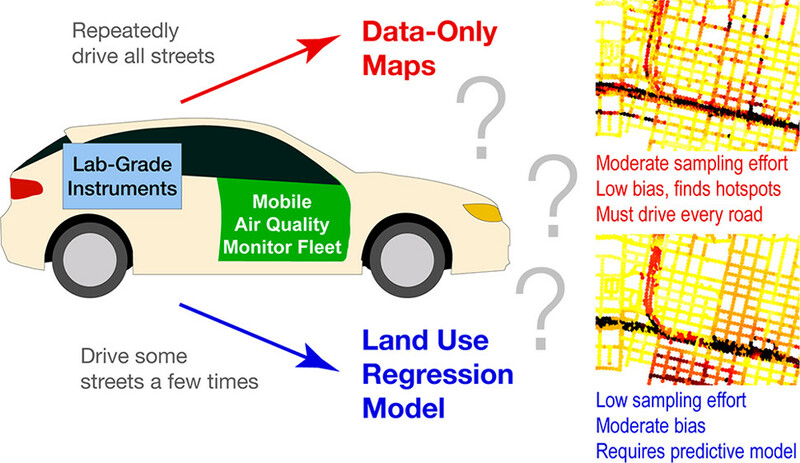 High resolution air pollution mapping with Google Street View cars: Exploiting big data. Environ. Sci. Tech, 2017. [open access, link]. Selected as ES&T's "Top Environmental Technology Article of 2017." We made repeated measurements of air pollution in Oakland, California using two specially equipped Google Street View cars. Aclima equipped these cars with their Environmental Intelligence sensing platform, which for this study incorporated research-grade fast-response gas and particle analyzers measuring at 1 second time resolution. Here, we focused on three urban air pollutants - black carbon particles (BC), nitric oxide (NO) and NO2 (nitrogen dioxide). For over a year, the cars repeatedly mapped the streets of three Oakland neighborhoods during daytime hours. The cars visited different neighborhoods on different days, collecting more than 3 million data points and logging more than 15,000 miles. Each city block was sampled on an average of 31 different days throughout the year. Our group then developed data analysis algorithms to convert this mobile monitoring dataset, perhaps the largest of its kind, into maps that represent consistent long-term trends of daytime, weekday air quality. By using data from repeated measurements on each city block over an entire year, our data analysis approach produces stable estimates of the long-term daytime median concentration for each 30 meter segment of roadway that we sampled. Our analyses suggest that concentration estimates for individual road segments are precise to within ± 10-20%. We find that air pollution is surprisingly variable inside neighborhoods: concentrations can persistently vary by as much 5-8× within an individual city block. 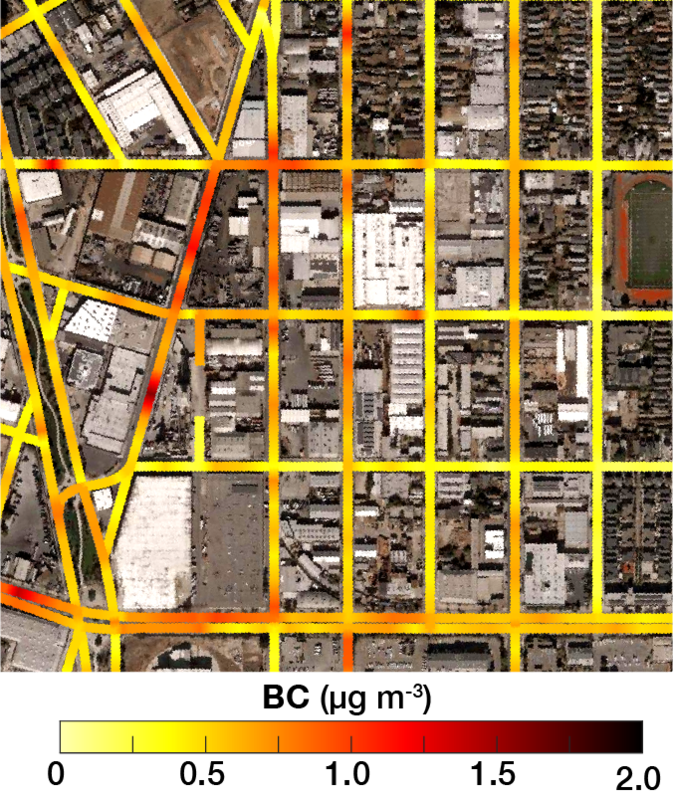 We were especially surprised to find small, consistent pollution hotspots on many city blocks. Each of these hotspots may arise for its own idiosyncratic reasons. We believe that common causes of hotspots include traffic congestion, industrial emissions, cooking emissions, and local truck or bus traffic. For our study area, pollution at the single official air quality monitoring site were similar to the levels we measured on quiet residential streets. However, many streets that we measured were consistently much more polluted than the official air quality data would suggest. We conducted this study in collaboration with several organizations. The scientific team included researchers from UT-Austin, Utrecht University, University of British Columbia, University of Washington, Lawrence Berkeley National Laboratory, Environmental Defense Fund, and Aclima, Inc. Funding for the research was provided by the Environmental Defense Fund. Google supported the operation of their Google Street View cars, which Aclima equipped with their Ei sensing platform. We worked with local community groups, including the West Oakland Environmental Indicators Project, to interpret our results and understand their implications for the community. Finally, the Bay Area Air Quality Management district provided us with access to their ambient monitoring datasets. Towards scalability: Measure or model? To scale this measurement approach around the world, it may be helpful to identify sampling approaches that minimize the amount of "driving effort" required to collect a city's dataset. One approach to doing so would be to simply reduce the number of repeated measurement visits to every street -- sacrificing precision, but gaining efficiency. An alternative approach is to predict air quality everywhere using models trained on measurements made on only a subset of a city's streets. Our unusually rich dataset from Oakland allowed us to investigate the relative advantages of each of these two approaches. While each approach has advantages, we demonstrate that useful air quality maps can be estimated from mobile monitoring campaigns even with minimal data collection. Our partners at Environmental Defense Fund have prepared an interactive version of our dataset. 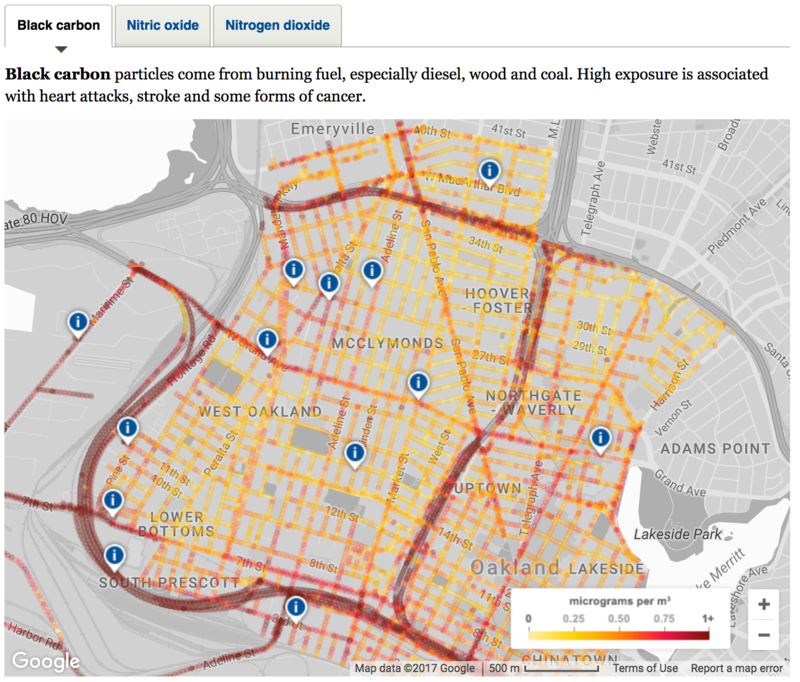 These interactive maps allow the user to explore how air pollution varies within neighborhoods of Oakland, California. The full dataset from this study is available via the EDF website.